Posted on August 25, 2013 under Fiction. It all began with the fall of a meteorite and the crater it made. In its centre was a red notebook, sticking out of the ground—the first (or was it really the last?) of Professor Shonku’s diaries. 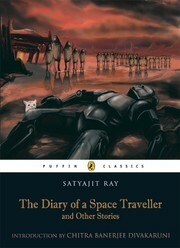 Professor Trilokeshwar Shonku, eccentric genius and scientist, disappeared without a trace after he shot off into space in a rocket from his backyard in Giridih, accompanied by his loyal but not-too-intelligent servant Prahlad, his cat Newton, and Bidhushekhar, his robot with an attitude. What has become of the professor? Has he decided to stay on in Mars, his original destination? Or has he found his way to some other planet and is living there with strange companions? His last diary tells an incredible story…Other diaries unearthed from his abandoned laboratory reveal stranger and even more exciting adventures involving a ferocious sadhu, a revengeful mummy and a mad scientist in Norway who turns famous men into six-inch statues. Exciting, imaginative and funny, the stories in this collection capture the sheer magic of Ray’s lucid language, elegant style, graphic descriptions and absurd humour. The indomitable Professor Shonku has returned, to win himself over a whole new band of followers! This entry was tagged under: Science Fiction, Short Stories. Both comments and pings are currently closed.